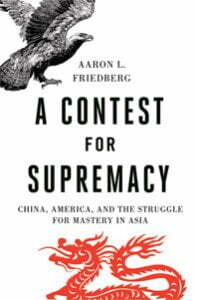 In A Contest for Supremacy: China, America, and the Struggle for Mastery in Asia, Aaron Friedberg argues that fundamental ideological differences, coupled with tensions inherent in power transition, have placed the United States (U.S.) and the People’s Republic of China (PRC) on a path toward increasing competition, and, potentially, collision. For all its apprehensiveness about the trajectory of U.S.-China relations, the book offers a familiar proposal for American policymakers. Friedberg proposes to augment ongoing economic, social, and political exchanges between the two countries with more honesty and openness about Sino-American differences. He argues that a reduction in the U.S. appetite for cheap imports and credit, as well as the continued development of American military capabilities and political partnerships in Asia, should accompany this greater frankness. That Friedberg adds another influential voice calling for movement in this direction suggests the development of what may be an emerging mainstream view about China policy in American academic and policymaking circles. Review Essay on Aaron L. Friedberg. A Contest for Supremacy: China, America, and the Struggle for Mastery in Asia. New York: W.W. Norton and Company, 2011. ISBN: 978-0-393-06828-3 (hardcover, $27.95); 978-0-393-34389-2 (paperback, $17.95). Friedberg arrives at his perspective on China from a more pessimistic starting point, however. The book begins by positing that inherent insecurities and differences over the distribution of benefits in the international system undergird U.S.-China relations at a time of China’s relative rise compared to the United States. Augmenting these pressures are the ideological divides and attendant suspicions between a politically liberal United States that hopes for a democratic China, and an authoritarian, statist PRC intent on securing continued Communist Party rule. Such conditions, if unchecked, may overcome the mitigating effects of economic interdependence, institutional constraints, nuclear deterrence, and even the need to address common threats like terrorism, environmental concerns, and disease. Democratization too may portend instability and adventurism by Chinese leaders, given the supposed propensity of liberalizing regimes to behave provocatively toward both other countries and their own populations. The volume builds its case for a more apprehensive understanding of trends in Sino-American relations through a review of the history of U.S.-PRC relations and observations of contemporary Chinese policy discussions. Friedberg’s account of China-U.S. relations since the PRC’s founding in 1949 is one of ideological opposition tempered by a two-decade long marriage of convenience against the Soviet Union between 1969 and 1989. This interregnum, which also saw China’s integration into the liberal world economic system, unraveled with Beijing’s crackdown on demonstrators in 1989 and the U.S.-China standoff over Taiwan in 1995-1996. In its place came a U.S. approach to China that mixed economic, social, and political engagement with some containment-like aspects such as the bolstering of regional alliances and the enhancement of military capabilities–what Friedberg terms “congagement”. (88-119) The concurrent PRC response, which Friedberg gleans largely from available Chinese academic, journalistic, and policy writings, has been to invest in capabilities and institutional frameworks that can limit and eventually replace Washington’s presence in Asia. A consequence of these enduring U.S.-China tensions is an intensifying contentiousness between the two countries, which Washington can try to manage by directly facing the challenges China presents even as it persists with engagement. Beijing’s counter to the American challenge may be to use its expanding economic heft to at once erode Washington’s regional alliances and U.S.-backed multilateral frameworks, while developing ways to deny the United States military access to Asia. For its part, Washington may be attempting to further integrate the PRC into existing international institutional and economic arrangements while finding limited responses to growing Chinese military prowess given its current economic strains. Short of a sudden and unlikely Chinese transition to full-blown democracy, Friedberg believes that an emphasis on engagement is insufficient to protect American interests, just as confrontation with and appeasement of China are untenable. The way ahead may be to back engagement with openness about differences, decreased American economic dependence on China, enhanced alliances and partnerships, and an American military transformed to counteract potential Chinese military strengths. One of A Contest for Supremacy’s strengths is its ability to draw insights about Sino-American relations from current debates in international relations, but this also implies that the book may include perspectives that can be further bolstered empirically. A key source of pessimism about trends in U.S.-China relations comes from the uncertainty inherent in the international system, and the presumed propensity for war between major powers – especially when significant shifts in relative capabilities among leading states occur. Another is that democracies and non-democracies are fundamentally suspicious of each other; a condition exacerbated by the possibly high stakes of losing power in non-democracies that may encourage their leaders to use external crises to deflect internal problems. Existing research undoubtedly supports Friedberg’s perspectives, but current scholarship continues to demonstrate some ambivalence over these matters. Credible studies also downplay the frequency of war in world politics, even among major powers, the potential for diversionary war, the conflict-proneness of liberalizing regimes, and the differential treatment of non-democracies by democracies. Conceptual underpinnings aside, the book can also further highlight the roles that non-leading powers in Asia and elsewhere can play in affecting U.S.-PRC interactions, both inadvertently and otherwise. Friedberg primarily and rightly sees the region surrounding China as a likely site of contention between Beijing and Washington, and devotes attention to the potentially divergent attractions and concerns that China and the United States present to regional states. Among other things, regional actors simultaneously worry about American withdrawal, American overreaction to China, Chinese assertiveness, insufficient Chinese integration, and each other. Their attempts to address such matters can exacerbate security dilemmas between the U.S. and China by fueling fears of abandonment and isolation in Washington, containment in Beijing, and entrapment in both capitals, complicating the policy environment. American outreach in South and Central Asia, the Middle East, Africa, and Russia can likewise unsettle China, just as Chinese overtures toward the Middle East, Africa, Latin America, BRICS (Brazil, Russia, India, China, and South Africa), and even Europe can add to U.S. unease. This volume displays the meticulous approach and attention to detail that characterizes Friedberg’s scholarship, but could benefit from more care towards the sources it uses. Attributing a Chinese preference for “deception” and “surprise attack” to “deep strains in Chinese strategic culture” can open the book to criticisms of caricaturing and essentializing China — charges the volume does not need to take on in order to be persuasive. (43) The same may be true of the underlying view of “Eastern” strategic thought as “more organic and improvisational and less mechanical and deterministic,” which seems more consistent with popular conceptions than scholarship on intellectual and scientific history. (123) Friedberg could also better explain the degree of trust he places in the openly available media, academic, and policy sources the book uses in translated form to examine Chinese foreign policy, particularly given the relative opacity of the Chinese system. The quality and representativeness of available data are perennial challenges that students of contemporary China constantly face. A Contest for Supremacy contributes to current discussions of U.S.-China relations by underscoring the need for the United States and China to work with each other in a way that accounts for the real and persistent differences between the two countries. Friedberg recognizes that Washington and Beijing need to actively manage collaboration as well as contestation. The United States, China, and the world could fare worse from unbridled major power rivalry and overemphasizing cooperation at the expense of handling real differences. This is consistent with what appears to be a growing trend in American expert opinion calling for more firmness in areas of Sino-American friction to complement continued and extensive engagement. Such thinking about managing the complexities of the Sino-American relationship is clearly well-considered and timely, but success depends as much on Chinese reactions as it does effective American policy implementation. Here, the vagaries of American and Chinese domestic politics as Washington grapples with economic restructuring while Beijing struggles with growth amid demographic change and rising nationalism may give some pause to supporters of this approach. Ja Ian Chong is Assistant Professor of Political Science at the National University of Singapore. He is author of External Intervention and the Politics of State Formation: China, Indonesia, Thailand – 1893-1952 (Cambridge University Press, 2012). Ian’s current research explores the collective effects of responses to power transition, contending historical understandings of China in world politics, and the influence of historical legacies on alliance politics in post-authoritarian states. He received his Ph.D. in politics from Princeton University. See Robert G. Gilpin, War and Change in World Politics (Cambridge: Cambridge University Press, 1981); Jack L. Snyder, From Voting to Violence: Democratization and Nationalist Conflict (New York: W.W. Norton and Company, 2000); and Jack L. Snyder, Myths of Empire: Domestic Politics and International Ambition (Ithaca, NY: Cornell University Press, 1991). See M. Taylor Fravel, “The Limits of Diversion: Rethinking Internal and External Conflict”, Security Studies, Vol. 19 No. 2 (May 2010): 307-341; Erik Gartzke, “War is in the Error Term”, International Organization, Vol. 53 No. 3 (Summer 1999): 567-587; Vipin Narang and Rebecca M. Nelson, “Who are These Belligerent Democratizers? Reassessing the Impact of Democratization on War”, International Organization, Vol. 63 No. 2 (April 2009): 357-379; Bruce Russett, Christopher Layne, David E. Spiro and Michael W. Doyle, “Correspondence: The Democratic Peace”, International Security, Vol. 19, No. 4 (Spring, 1995): 164-184; and Reinhard Wolf, Erich Weede, Andrew J. Enterline, Edward D. Mansfield and Jack Snyder, “Correspondence: Democratization and the Danger of War”, International Security, Vol. 20 No. 4 (Spring 1996): 176-207. Benjamin A. Elman, A Cultural History of Modern Science in China (Cambridge, MA: Harvard University Press, 2006); Benajmin A. Elman, On Their Own Terms: Science in China, 1550 – 1900 (Cambridge, MA: Harvard University Press, 2005). Bjorn Alpermann, “Political Science Research on China: Making the Most of Diversity,” Journal of Chinese Political Science, Vol. 14 No. 4 (September 2009): 343-356; Allen Carlson, Mary E. Gallagher, and Kenneth Lieberthal, Contemporary Chinese Politics: New Sources, Methods, and Field Strategies (Cambridge: Cambridge University Press, 2010); Sujian Guo (ed. ), Political Science and Chinese Political Studies: The State of the Field (New York: Springer, 2012); Alastair Iain Johnston, “Is China a Status Quo Power?” International Security, Vol. 27 No. 4 (Spring 2003): 49-56. See Thomas J. Christensen, “The Advantages of an Assertive China,” Foreign Affairs, Vol. 90 No. 2 (March/April 2011): 54-67; and Kenneth Lieberthal and Wang Jisi, Addressing US-China Strategic Distrust (Washington, DC: The John L. Thornton Center, Brookings Institution, 2012).